East Side Mags is proud to be working with Brigid Allanson - Kubert School graduate, freelance artist and graphic designer - to bring comic drawing classes right here in store every Saturday morning! Price of admission includes everything you need, all the supplies, a blank comic book and all 4 weeks of classes! Each class takes place during the 4 Saturdays within each month. Just print out, complete and send us the form below and you're all set! Or you can complete the form to the right and click "SUBMIT" and we'll get your registration info right away! Pricing for the class works like this: $45 for the first week (includes all supplies needed) and $35 per week after that. OR buy out all 4 classes in the month and pay $120 for all 4 classes! You can even keep taking the classes week after week, month after month! The best part about Brigid's teaching style is that she shows you how to draw, not how to draw specific characters. The method she teaches can be applied to any character or object you are trying to draw! For dates and space availability, you can reach out to us through out Contact page, jeff@eastsidemags.com or call us at 862-333-4961 and we'll be happy to answer any and all questions. 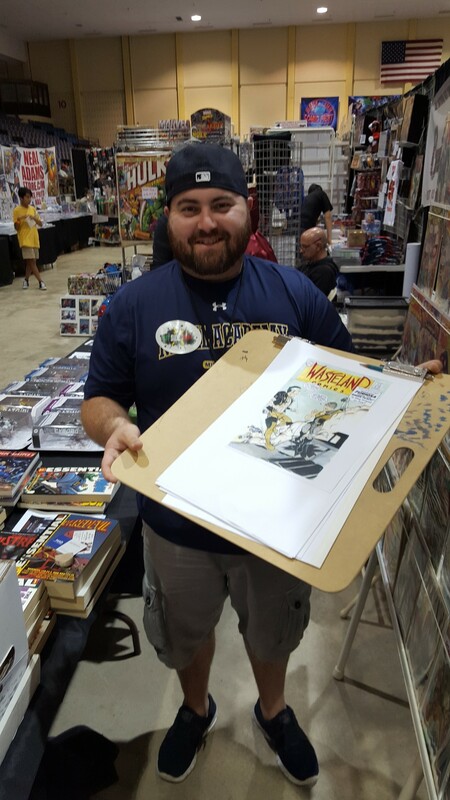 Ed Catto - columnist for ComicMix and Founding Partner for Bonfire Agency - was kind enough to reach out and interview Jeff about East Side Mags and our origins! You can check out the interview here! Ed was kind enough to ask Jeff to be a part of a panel at NYCC 2015 about the 7 Archetypes of comic shops with Atom! Freeman of Valiant Comics, Marc Hammond of Aw Yeah! 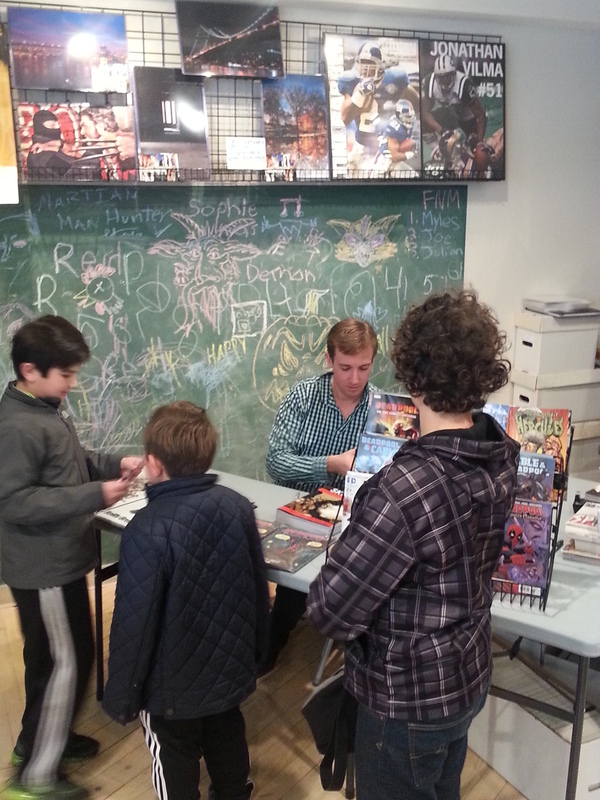 Comics and Gerry Gladston of Midtown Comics! 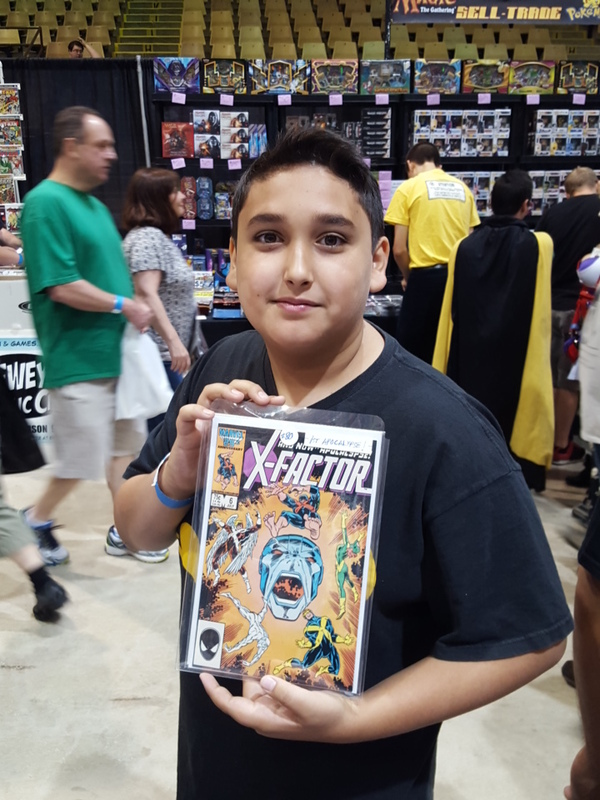 Everyone had a blast and the turnout was so good that, as Ed put it, they're putting the band back together for another round at NJ Comic Expo on November 21st! 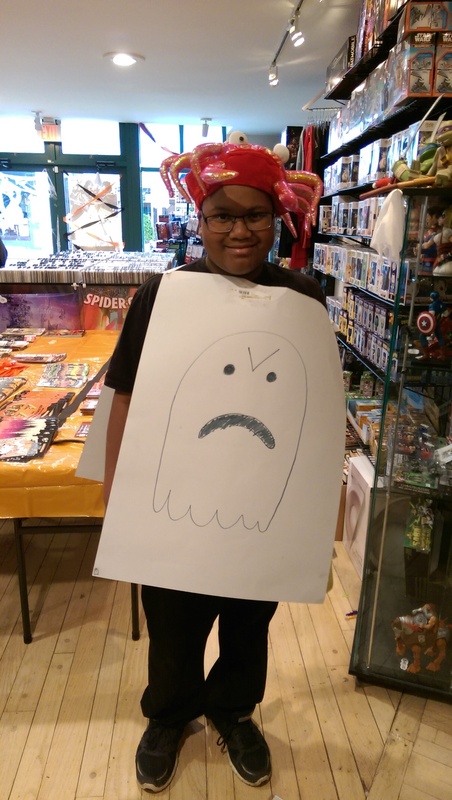 Halloween ComicFest 2015 - Results and Winners! HCF2015 was a BLAST! 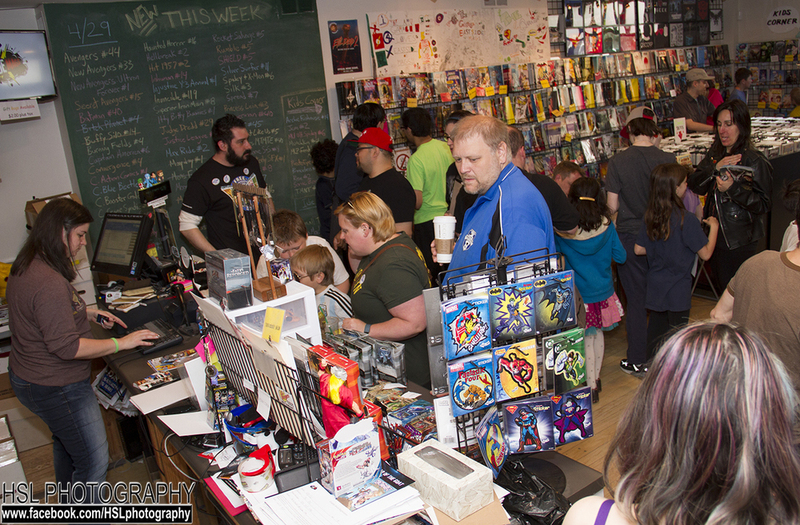 We had a ton of people turn out for an amazing event and gave out hundreds of FREE comics to kids, adults - anyone who showed up really! 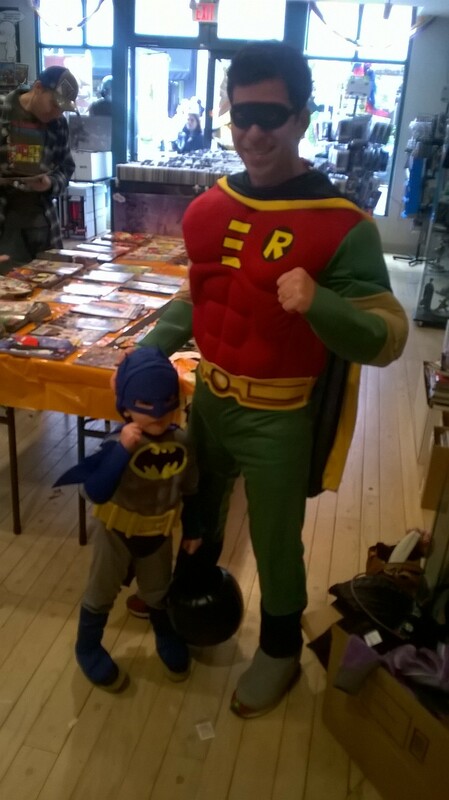 We could only have ONE winner - FINN BUTLER and his Flying Jetpack Boy costume! Well, we're rested and relaxed after an AMAZING weekend at GSCF! We had a wonderful time and would like to start by thanking Dave, Sal and Evan for putting together a stellar event and for inviting us to be a part of it! We can't even begin to tell you about all the amazing things we saw, the wonderful people we met and the great friends we got to see - ALL IN ONE PLACE! Our booth was more than just a way to sell product - we had some out-of-this-world talent at our table this weekend! 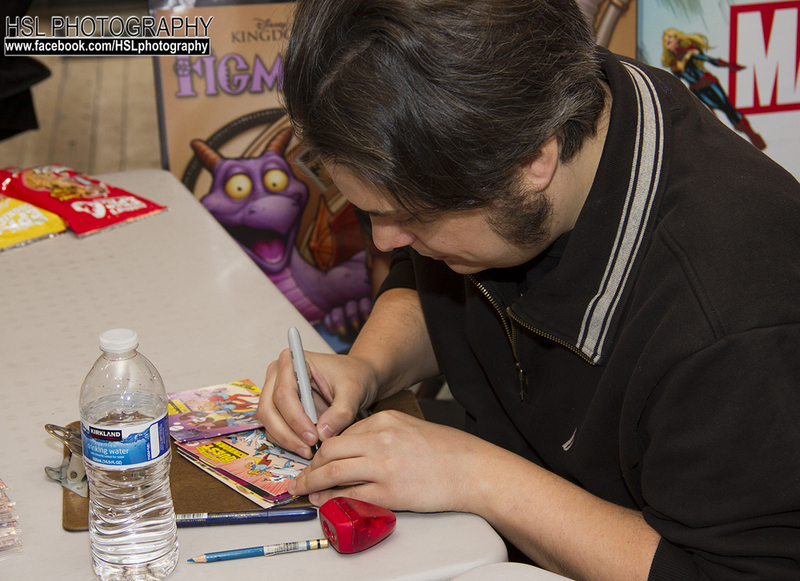 Brian Smith (Stuff of Legend, Intrepid EscapeGoat, Voltron Force, Spongebob Squarepants) was with us on Saturday along with Stephen Coughlin (Sanctuary) who were "WOW"-ing customers with their friendly, down-to-earth personalities and rockstar art skills - sketching for customers whether it was one of the characters they work on or Hulk, Batman, whoever! We also had the pleasure of sharing space with Katie Coe - a cosplayer from Delaware - gorgeous and talented, she debuted her brand new Dr. Strange cosplay and had prints of all her previous cosplay characters available for purchase! If you missed seeing her this weekend, you really missed out! ...and SO MANY MORE we can't get through it all! The turnout was great at the Con. 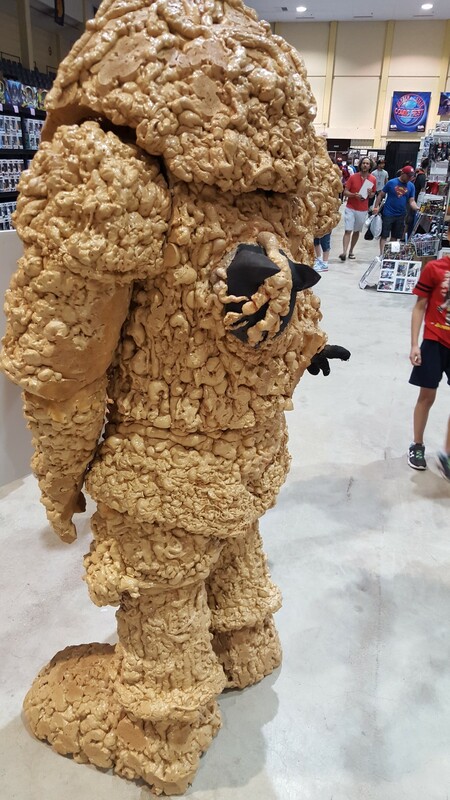 We saw a bunch of really great cosplayers (including a great Clayface cosplayer, complete with Batman stuck inside) and met a plethora of new collectors and comic fans! 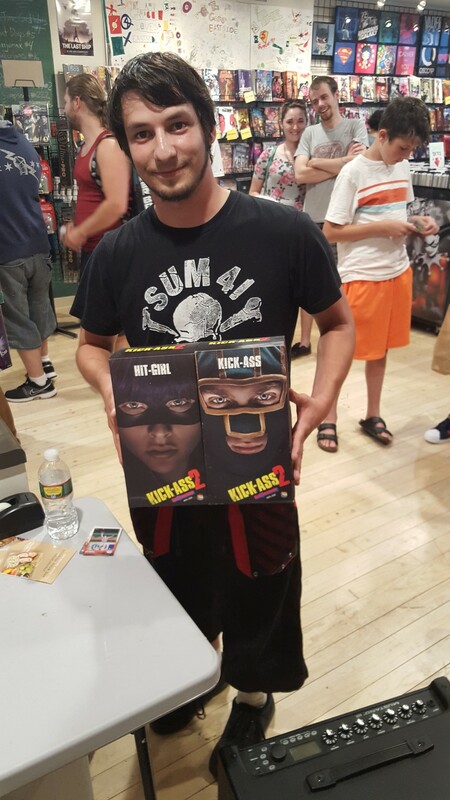 We also saw a bunch of our regular customers at the show who came out to show some love! We had an amazing time overall and cannot wait to do it all again next year! Last, but never least, Susan Bittman, Dave Toussas and Steph Vargas for holding down the fort and keeping the store running smooth so we could take advantage of this amazing opportunity! And on that note, we leave you with a short clip of the hardest working man in comics, the James Brown of comic books if you will endulge us, SEAN VON GORMAN fighting to get out of a straight-jacket to promote his book - Houdini! This guy is hilarious and has a ton of great stories. Enjoy! ...and we've got the BEST FRIENDS in the whole wide world! On Saturday, July 18th, we celebrated our one year anniversary in STYLE! To honor the occasion, we brought out some pretty heavy hitters to celebrate along with us! 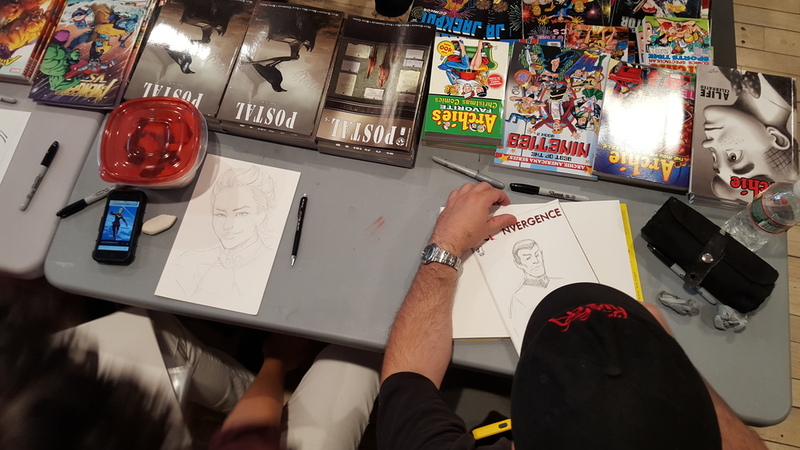 Archie artist extraordinaire, Fernando Ruiz was here to wow the crowd with his stellar drawing skills for Archie fans and comic fans alike! As the artist on various Archie titles including the new Archie vs Predator series, it was a complete honor hosting him for a second time. A nicer guy there never was, Fernando came here right after teaching his class at the amazing Kubert School to "wow" our customers with his talent! Here is an example - a sketch cover he did for us on our Spider-Gwen #1 blank cover. New to the scene, Isaac Goodhart was on-board as well. He draws a new comic called "Postal" for Top Cow and currently resides in Astoria. He and his lovely girlfriend were nice enough to come check out our little slice of heaven here in Montclair, sign copies of the first trade paperback for Postal that just came out and sketch for our customers! Here's a little something he whipped up for us. 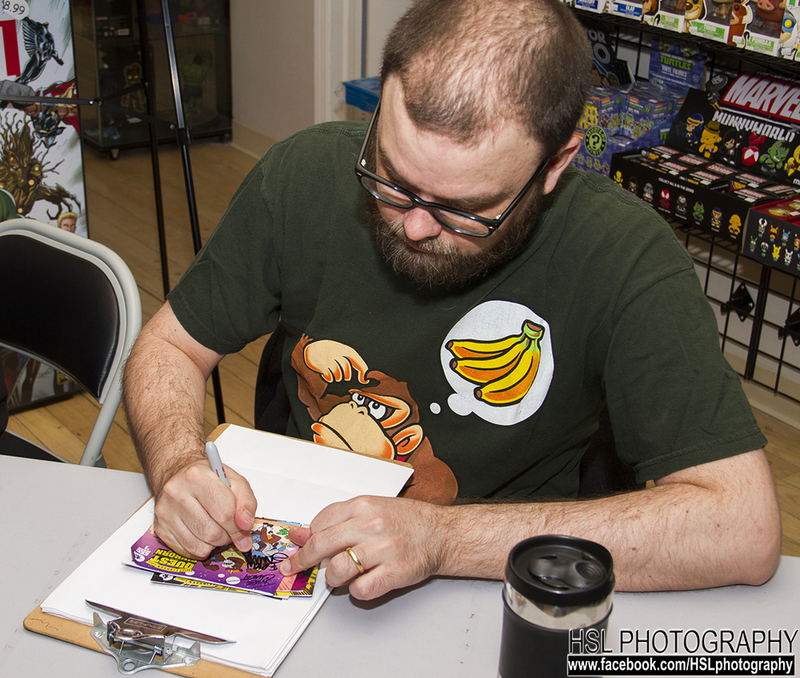 Last but NEVER least, our good friend and neighbor Brian Smith - artist and writer for books such as Spongebob Squarepants, Stuff of Legend, Voltron Force, the Intrepid EscapeGoat and MORE - came by his LCS (local comic shop for those wondering) and hung out with fans, customers and friends while sketching, signing and even ran home to grab some original art he'd been working on in his free time to show some fans including US! 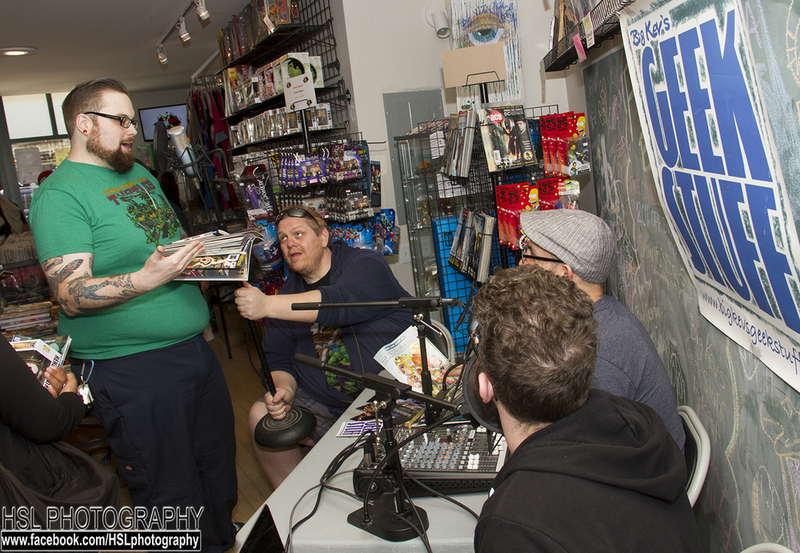 NOTE: Special shout-out to Greg Schigiel (artist/writer for Pix) and Stephen Coughlin (artist/writer for Sanctuary) for stopping by and hanging out with us! We really do have the best friends! If you thought all that wasn't amazing enough, we held an all day raffle called PACK WARS. See - you buy a pack of baseball cards and when raffle time came, we would see who had the best stat for the prize - most home runs, fewest strike outs, most innings pitched, best on base percentage, etc. Check out some photos below of all our amazing winners! 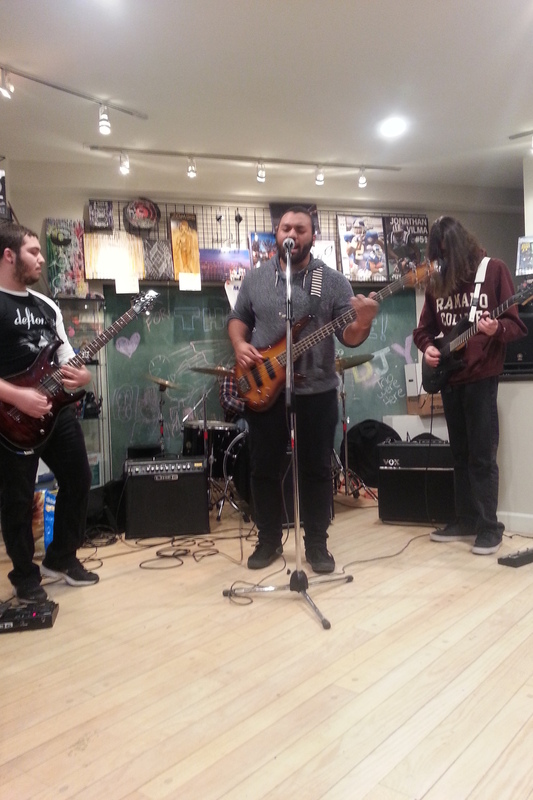 The day ended with a STELLAR, AMAZING, OUT-OF-THIS-WORLD performance by a local band comprised of some of Montclair's most talented high-schoolers - Tula Vera! 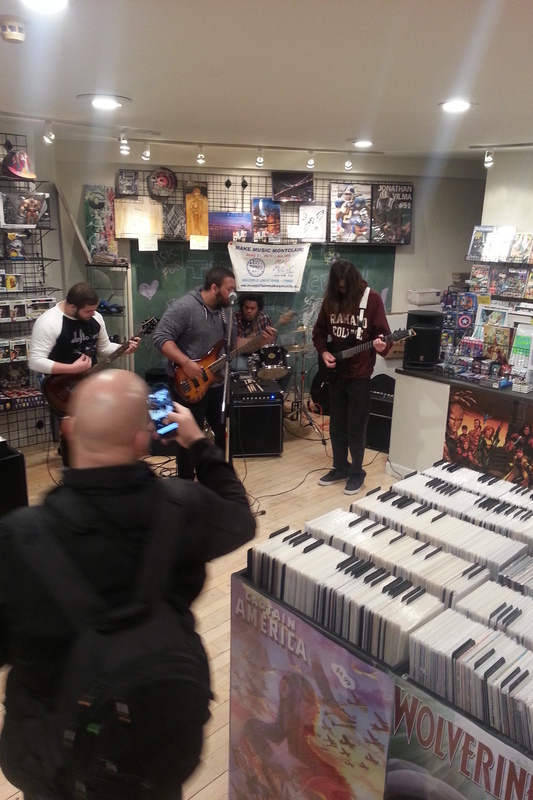 They performed in the store and ROCKED IT! You can check out the videos but it doesn't do them justice. 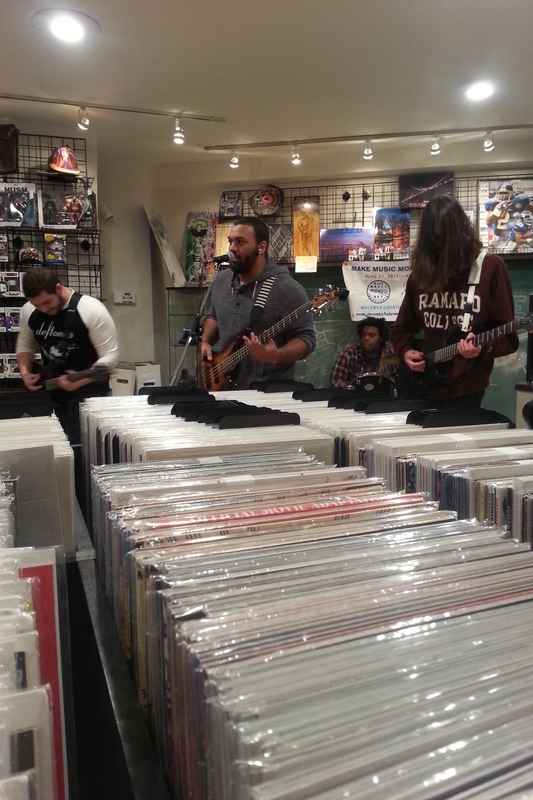 They are destined for greatness and it was an honor having them in the store. The future of rock looks bright indeed!!! To top it all off, in style, we received this from Mr. Stan Lee himself! BIG THANK YOU to Chuck Robertson for making the connection and being an all-around awesome guy with great sons! Needless to say, we had a blast! 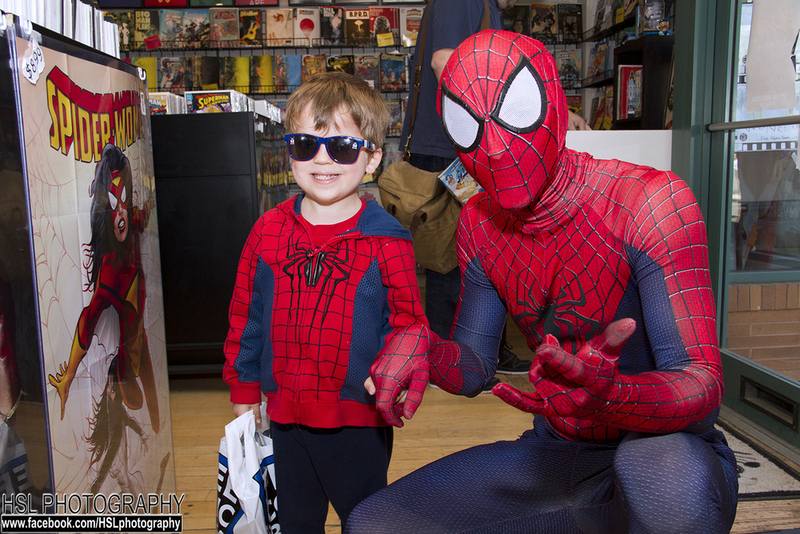 We have met some amazing people who work in comics and some even more amazing customers who truly love comics, art, stories, reading and fun over the last year and it looks like we'll be here for a long time to come! We swell with great anticipation about who we'll meet in the next year and the years to come! Thank you so much to all the artists, writers and - most of all - the customers and fans of comics for keeping the medium (and us) alive and thriving! We couldn't have done this without all of you and your support and our greatest pleasure is paying that back to you by hosting fun, exciting and entertaining events for you to attend and enjoy! East Side Mags on TV!!! 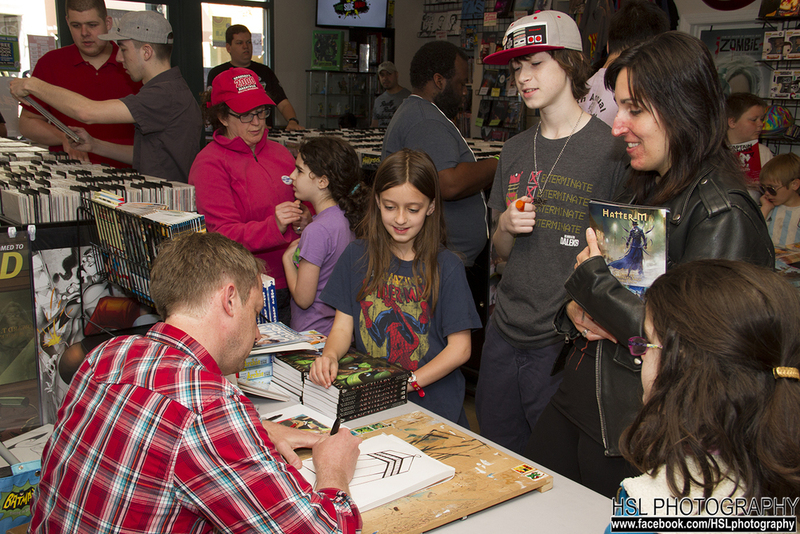 Thank you to NJ-12 News for stopping by East Side Mags this past Free Comic Book Day 2015! We received a number of calls from customers, friends and family telling us that we were on TV and finally have a copy to share with all of you! East Side Mags had the pleasure of hosting two AMAZING and SUPER TALENTED comic creators yesterday - Erica Schultz and Claire Connelly! Both ladies worked together on their book called The Unauthorized Biography of Winston Churchill: A Documentary which basically finds Winston Churchill traveling through time and dinosaurs! Yes, I said Churchill and dinosaurs! If that doesn't make this comic a must-read, then I have no idea what does! Erica is hilarious! 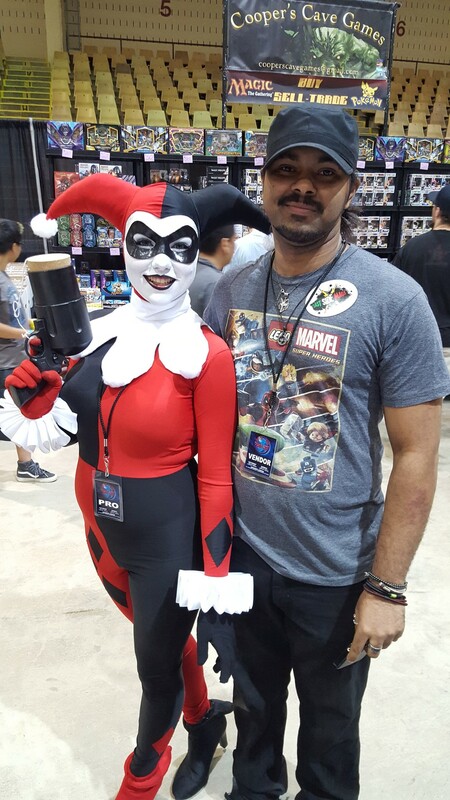 She got some great stories from working in comics and a real pleasure to hang out with! She's worked on a ton of stuff like M3 - about a female assassin on the run and has also worked on both issues or Rise: Comics Against Bullying by either writing the stories, editing them or both! Most recently, she's worked on the Swords of Sorrow one-shot featuring Masquerade and Kato. She will also be lettering all of the upcoming Swords of Sorrow issues by Gail Simone! You can check out Erica's work, especially M3 right here. Claire Connelly is one of the nicest people in this industry. She a super talented artist and has a ton of indie books out now! You can check out some her art and writing at her website - claireconnellycomics.com. If you're looking for a place to start, The Hunter's Moon, Looking Up and Animals are some of my personal favorites!!! Both ladies were super nice, fielded tons of questions from customers and were great company on a Saturday afternoon! 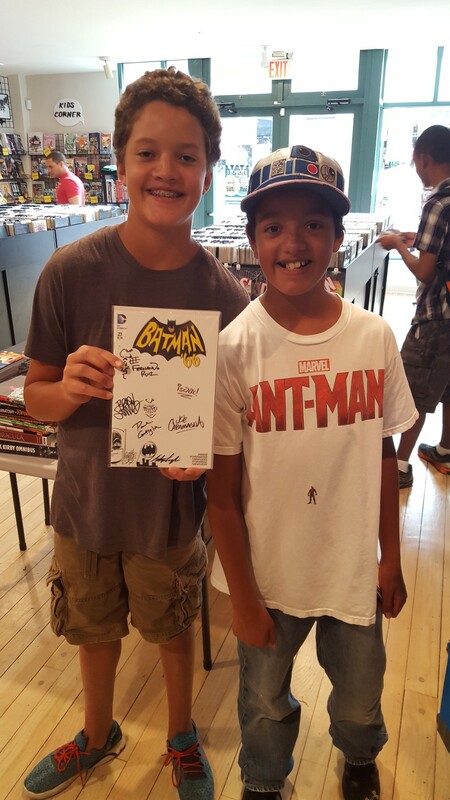 They even took the time to draw on some sketch covers for display in the store! Overall, we had a great turnout and it was so much fun to have the chance to hang out with Erica and Claire! They have some really fresh perspectives on the comics industry, they definitely know their comics trivia and are a blast to hang out with! Oh yeah - Adrian "the" King stopped by to hang out and record some sound bites for his podcast - Adrian Has Issues! He also snapped all the great photos on this page!!! You can check out his site here. East Side Mags would like to thank Erica, her husband A.J. 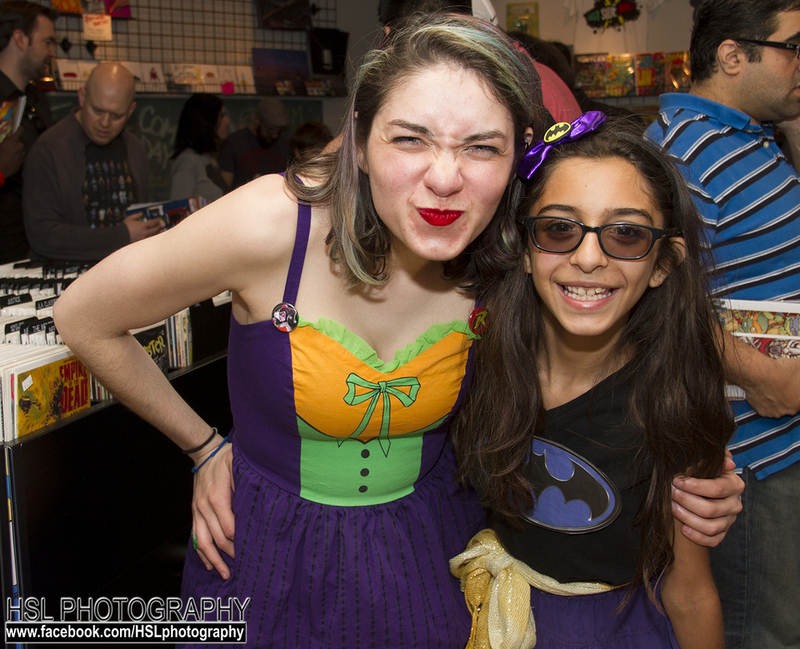 and Claire for coming out to the shop, hanging out with us and signing/sketching for all our customers! I know everyone had a blast and we look forward to hosting them again in the near future. If you are looking for amazing and amazingly talented women in the comics industry, you need look no further than Claire and Erica!!! 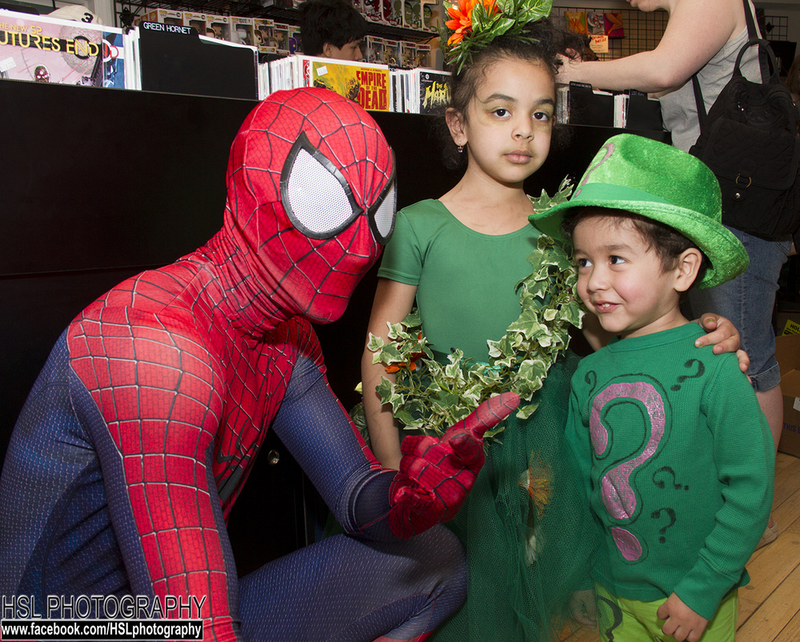 DK Publishing and LEGO sponsored a kids costume contest at East Side Mags on Free Comic Book Day - May 2nd 2015! 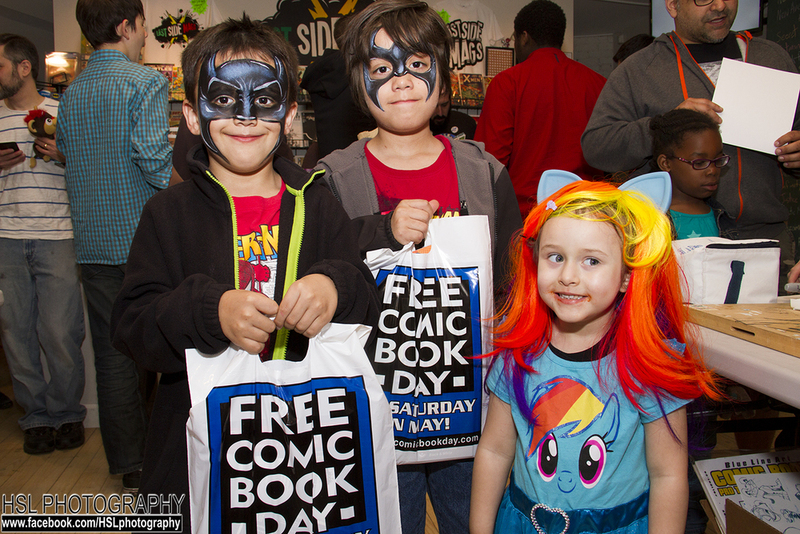 Free Comic Book Day was a HIT! 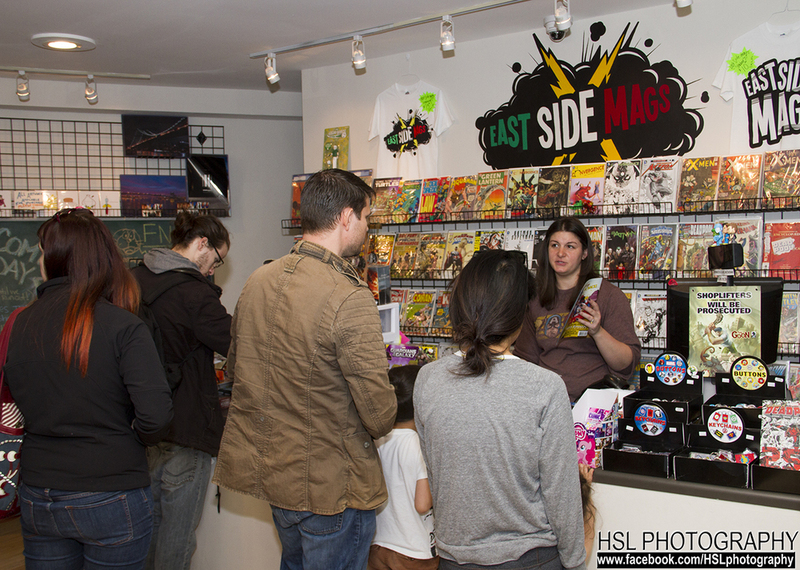 East Side Mags would like to thank EVERYONE who came out for FCBD! We had a TON of fun and it was great seeing familiar faces and SO MANY new ones! 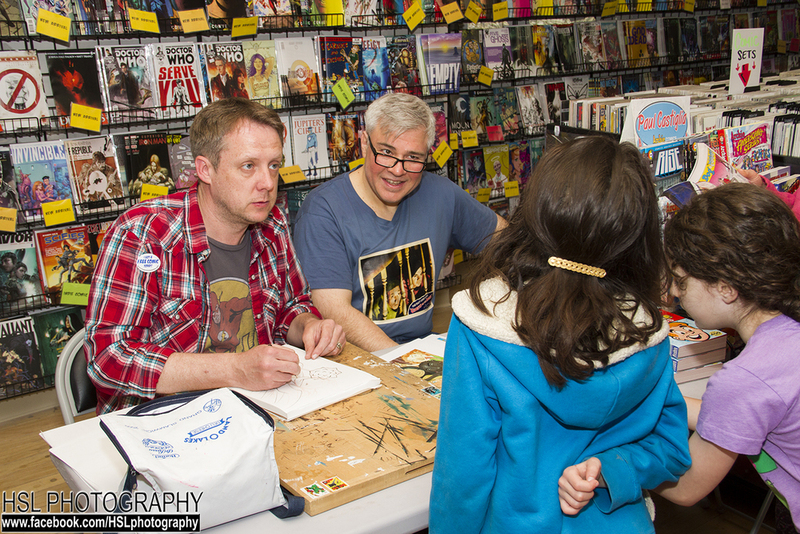 Paul Castiglia and Stephen Coughlin were here, signing copies of their work and sketching for customers! They had a great time and got to meet a TONG of fans face to face! Big Kev's Geek Stuff was here too! 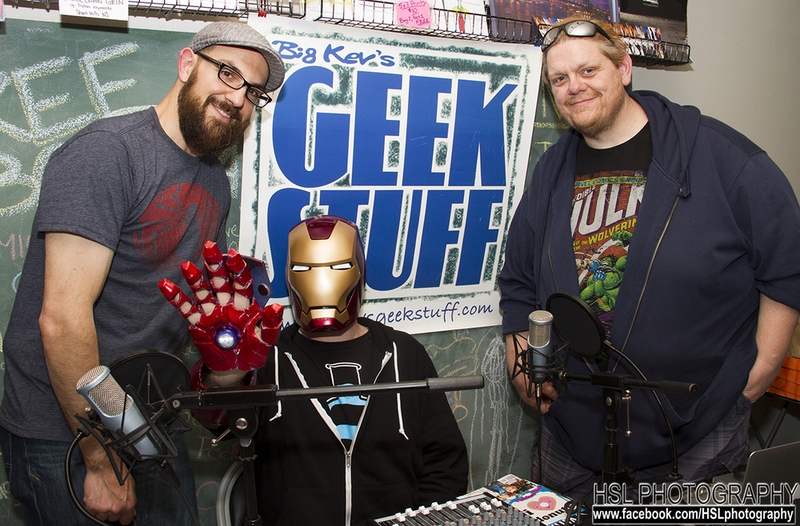 They set up near the line of customers waiting to purchase amazing comics and gear and got to interview and talk to customers about their favorite comics, what they're looking forward, tested out an Iron Man helmet and discussed their favorite FCBD issues! We had an amazing community art project going. 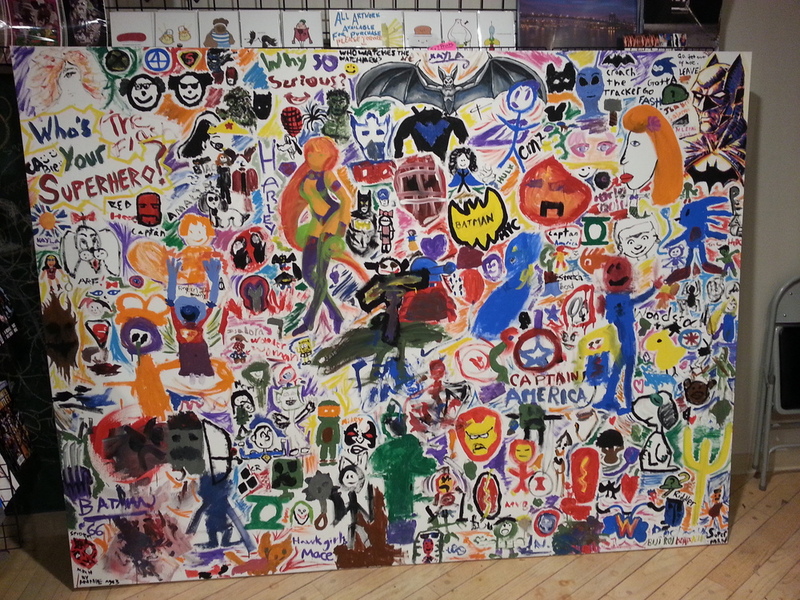 We brought in a 6' x 8' canvas that everyone who came out for FCBD got to paint on! 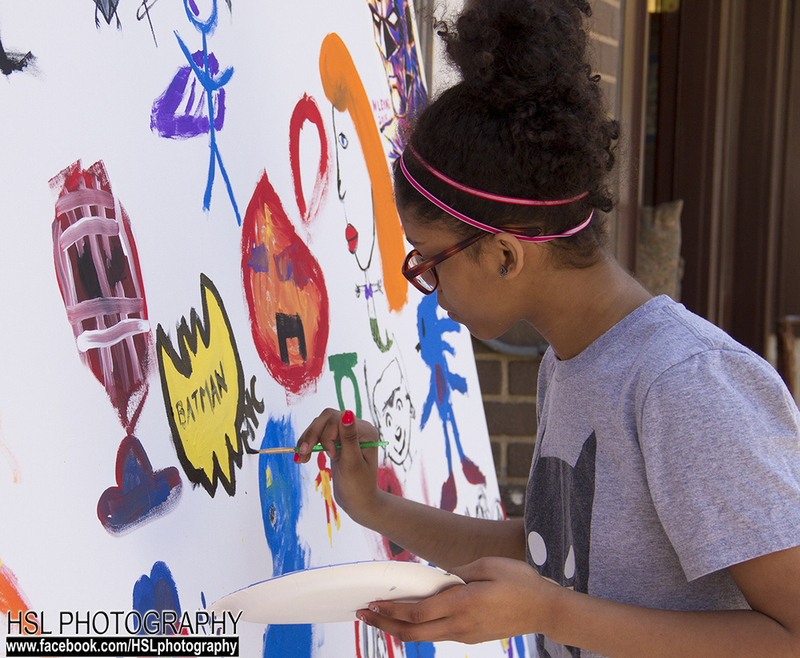 We had some amazing artists incorporate their work and a ton of kids who were just excited to paint! 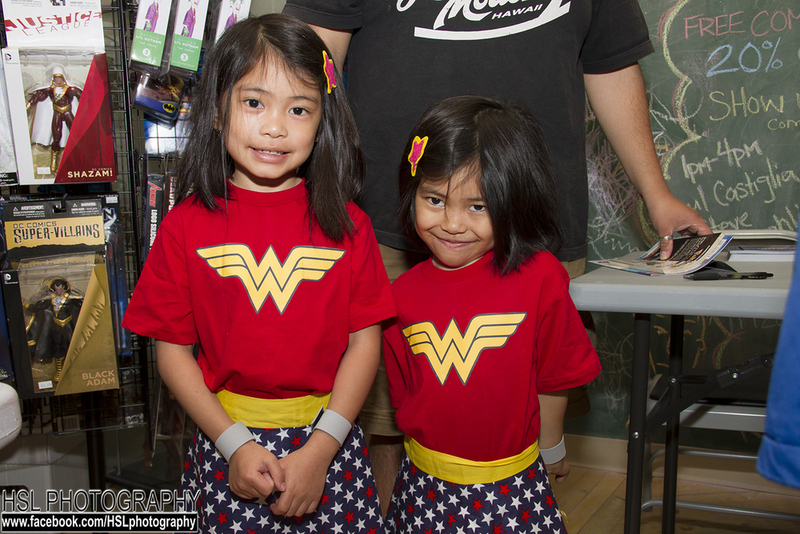 The theme was "Who's Your Superhero" to compliment the Montclair Public Library's summer reading program which also happens to be superhero themed! Once the painting was completed, we delivered it to the Library where you can see it in all its glory on display in the Young Adult section! 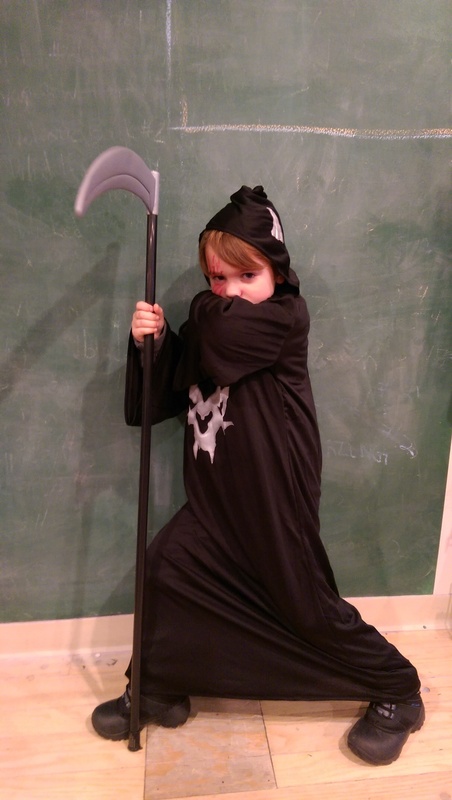 We had a costume contest sponsored by DK Publishing and LEGO! 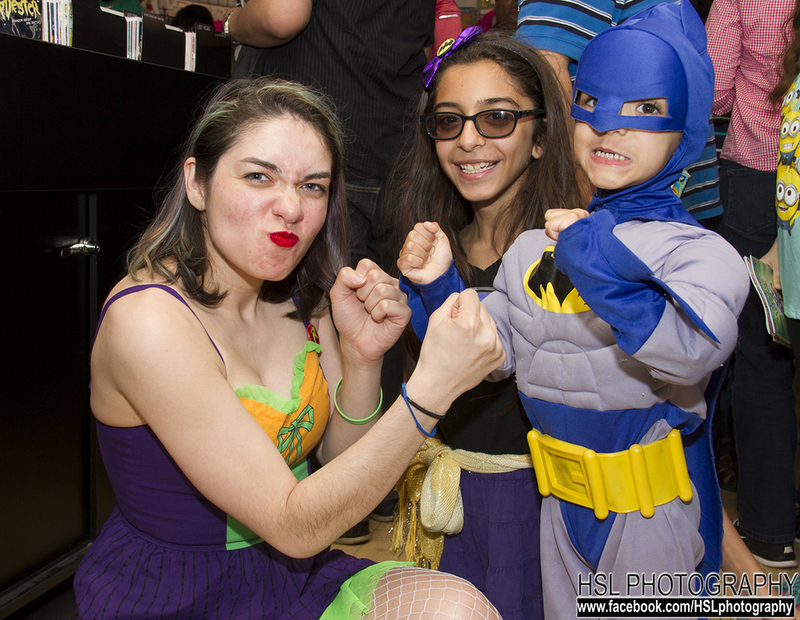 We had a whole bunch of contestants with really great costumes! 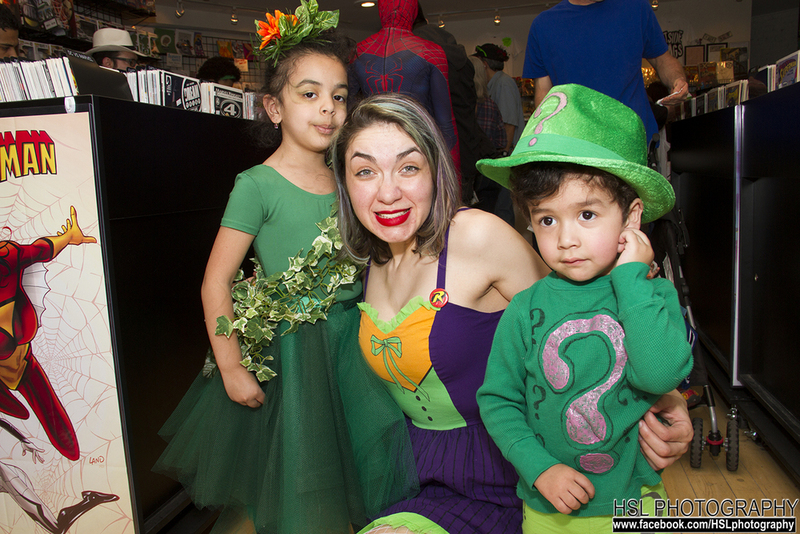 You can check out the great photos of our costumed customers below! All in all, we had an amazing time! Thank you so much to everyone on Team ESM - Steph Vargas, Joe Siegel, Marie Musiol, Susan Bittman, Howard Levy, Ellen Musiol, Paul Beck, Pele Marques, Josh, Zack and Chelsea Smith, Greg and Andrea Pason! Without all of you, this day would not have been nearly as smooth or as much fun as it was! Another BIG THANK YOU to all our customers, staff and friends for coming out and showing us love and support! A BIG BIG Special thank you to News 12 for coming out to do a quick story on us and HSL Photography for taking so many AMAZING pics too! Can't wait til next year! Free Comic Book Day VIDEO!!! 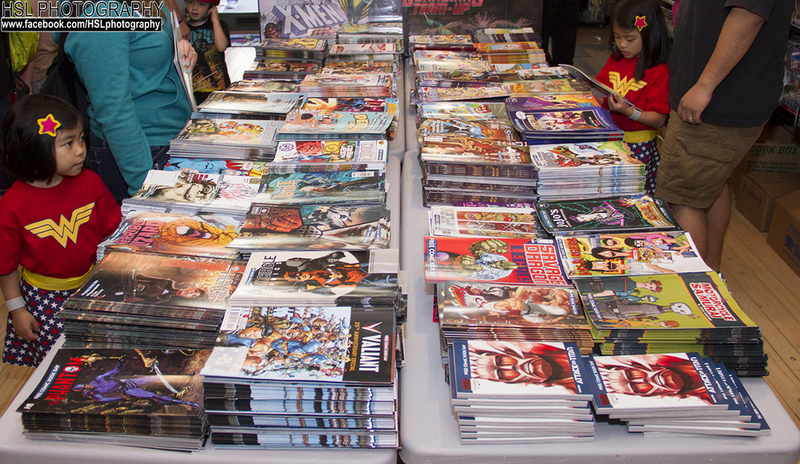 Check out an amazing Free Comic Book Day Video as produced by our good friend - Binh Nguyen from Montclair State University! 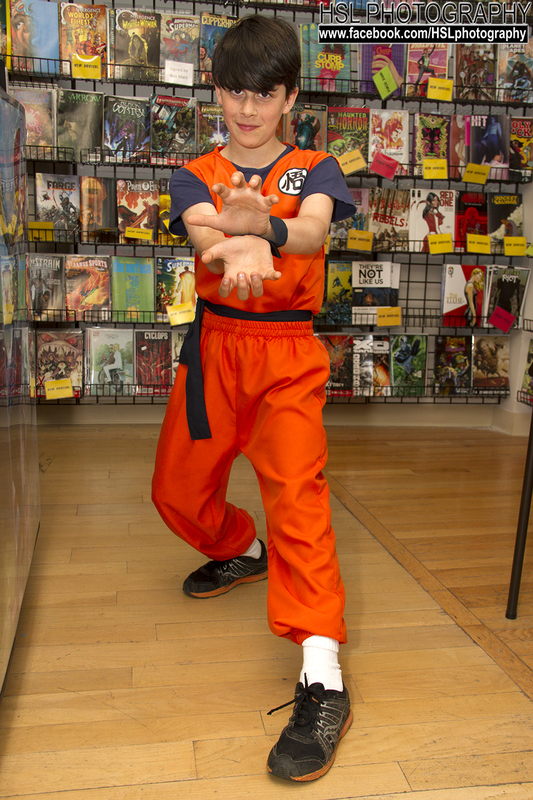 For details on Free Comic Book Day, go to www.freecomicbookday.com or click here! 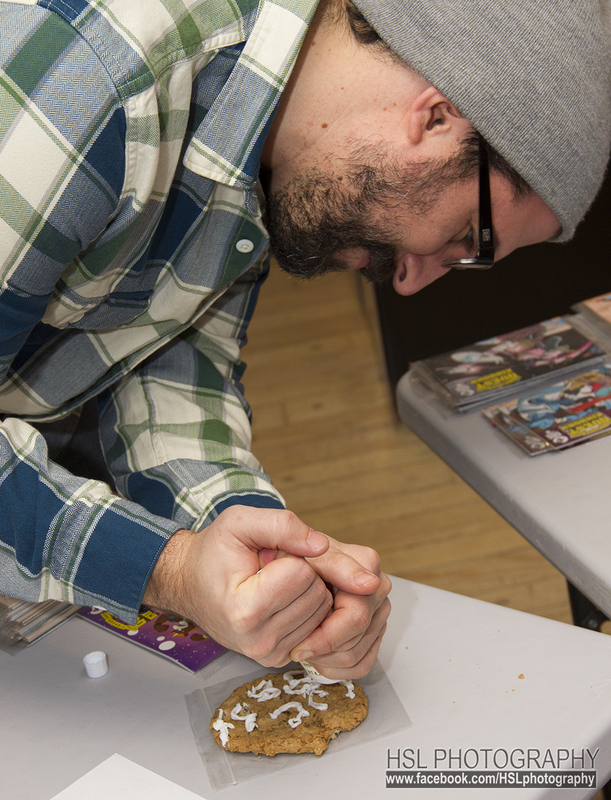 We're sitting on Cloud 9 right now and had the best day with Ron Marz and Tom Raney! Tom Raney is AMAZING! His art is fantastic, detailed and so crisp! He breezed through at least a dozen sketches for customers today and he made it look effortless! Check out the Facebook or Twitter feeds for some customer-posted pics but here's one of our Zombies Vs Robots sketch cover that we was gracious enough to do for us! Last Saturday, East Side Mags exploded with delicious baked goodness! Einhorn's Epic Cookies came out from NYC and the only word to describe the day is EPIC! It was a packed house with all three guys and we had additional guests like co-creators Heather Einhorn and Adam Staffaroni and Mr. Einhorn (Heather's dad) HIMSELF! 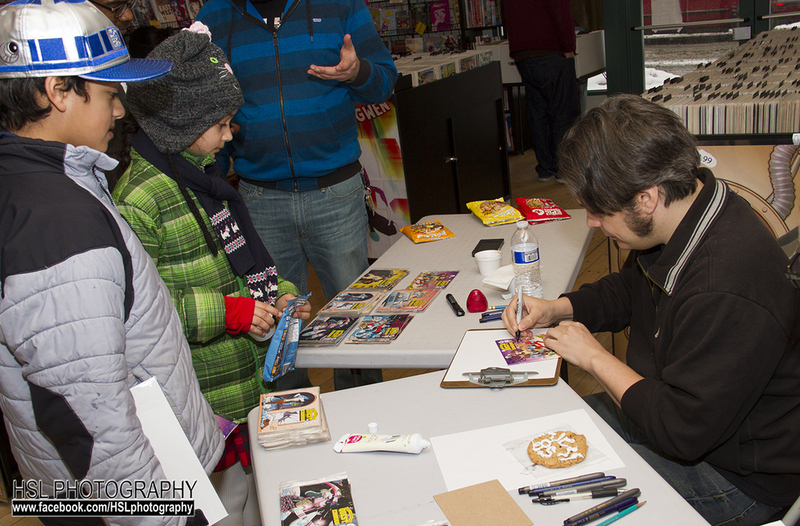 Cookies were eaten and comics were signed. Sketches provided on the spot for kids and adult fans alike! 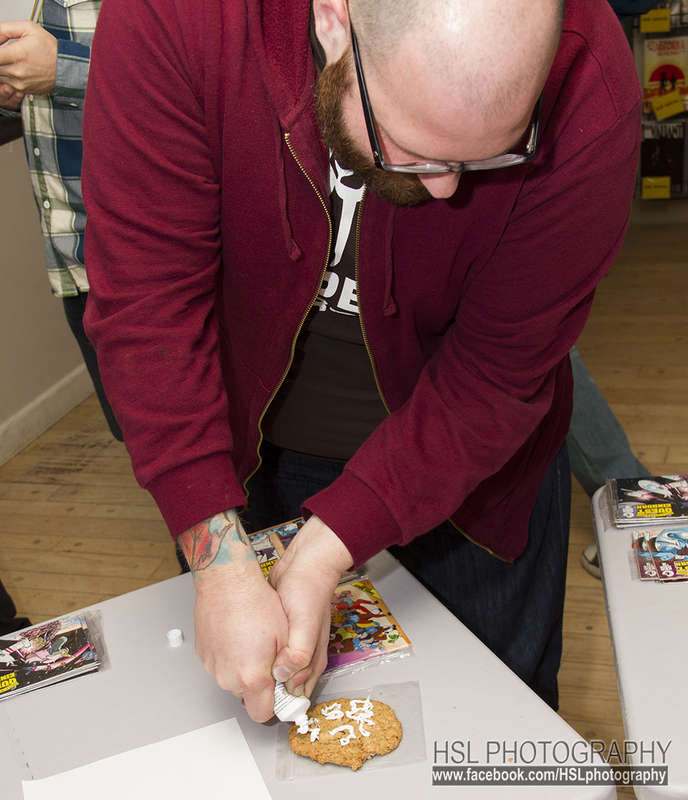 Everyone even tried to sign a cookie with icing! We all had a great time and a special THANK YOU to Simit House in Montclair for providing FREE hot chocolate to go with the cookies! Cookies. Comics. Hot chocolate. Unicorns. Family and friends. I don't think there is any better way to spend a Saturday afternoon in Montclair! East Side Mags will be carrying a variety of cookie flavors from Einhorn's Epic Cookies moving forward and look out for more ESM/EEC announcements coming SOON! 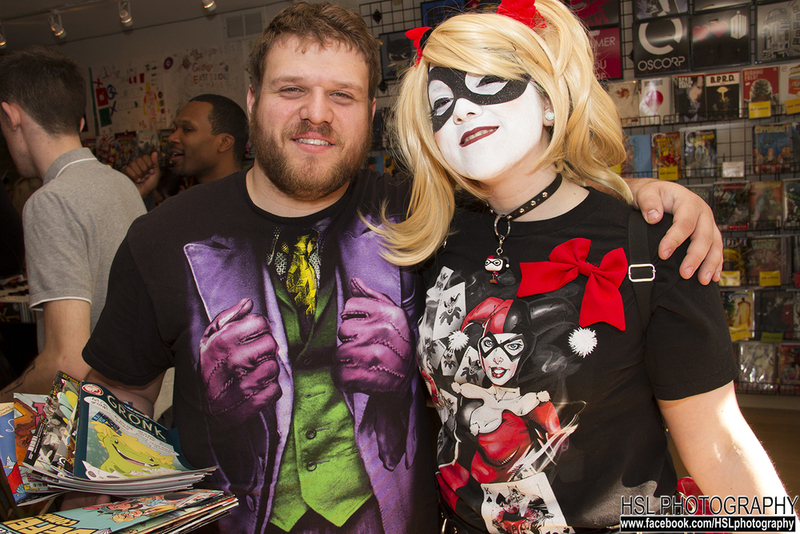 We had Reilly Brown in house and Deadpool fans came out in waves! Reilly had no shortage of fans asking questions about their favorite character, learning more about his Lobo run for DC Comics and getting some amazing sketches done by the man himself! We had Allie Biondi - writer/artist for Ella's Electric - and we had a blast! She had a great turnout and brought all kinds of cool swag with her including Ella's Electric guitar picks! 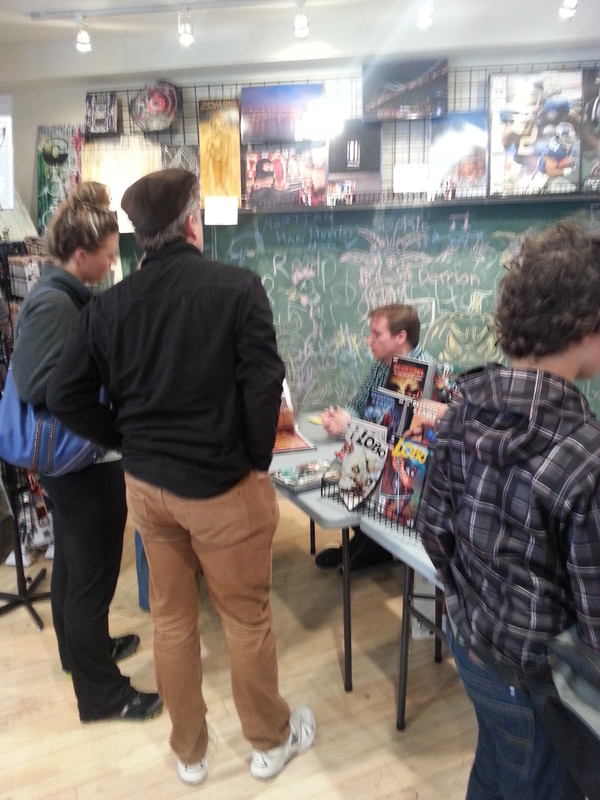 Eric Davies - creator of Hero Machine #1 and #2 was here. A local living legend, Eric debuted the all-new Hero Machine sketchbook (which flew off shelves within the first week) and the Hero Machine app for smartphones! Hero Machine is a GREAT all-ages book that gets kids excited about reading and creating their own heroes to use in the comics! 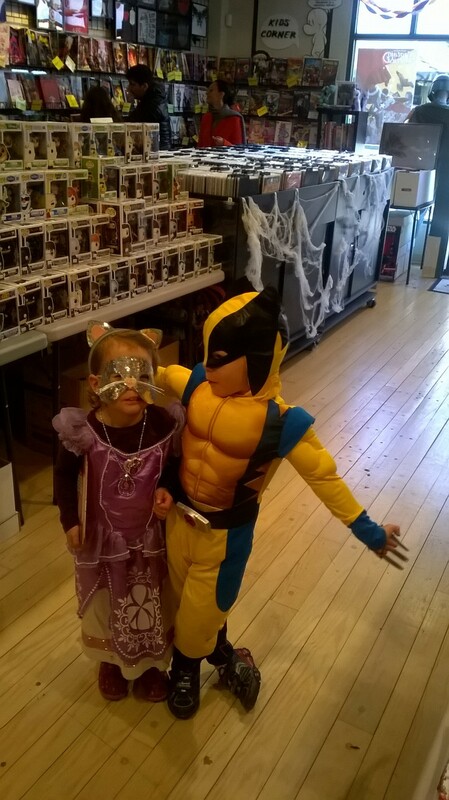 And the kids had a BLAST! 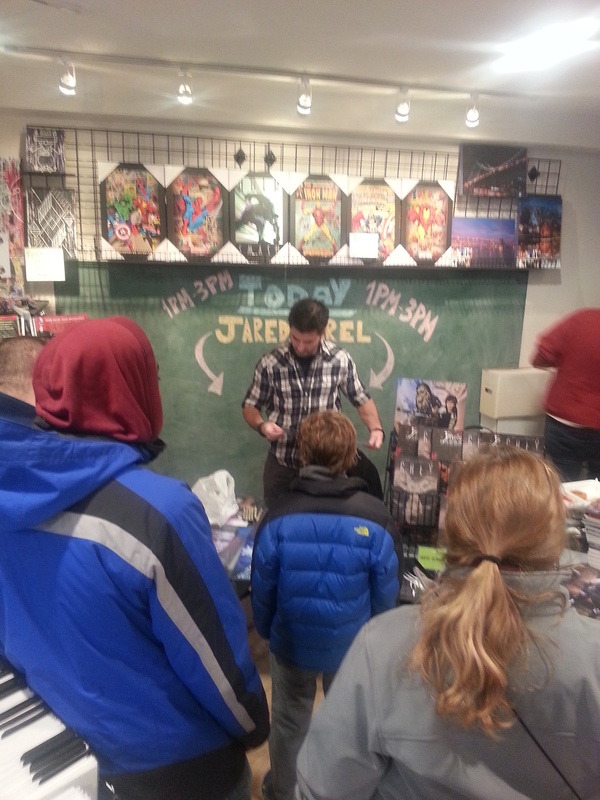 Jared Barel of Loaded Barrell Studios was here too! 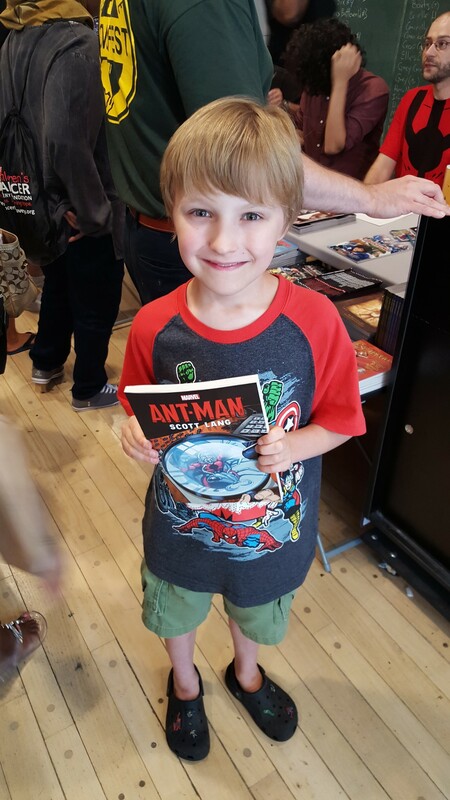 He brought both graphic novels - Brielle and the Horror and Grey - written and drawn by him and his brother Jordan and they were a HIT! 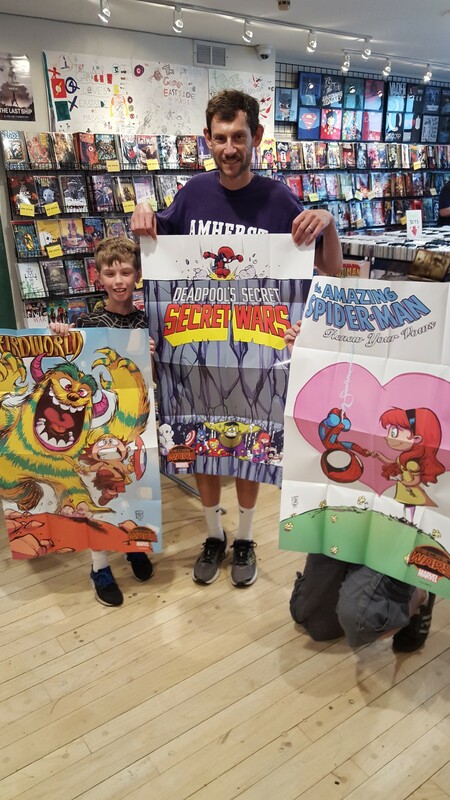 He brought some prints with him of familiar faces and sketches for his fans - including a totally sweet Maxx cover that you can see below! 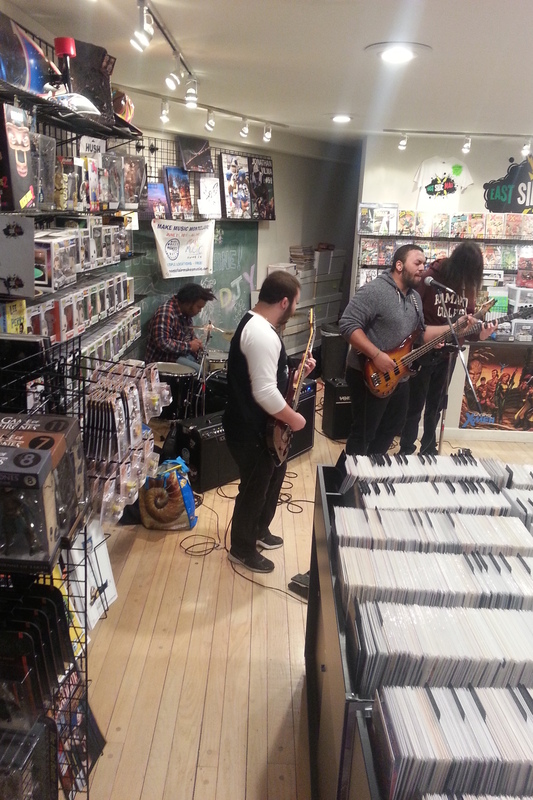 We had Ambary Lake in our store - rocking out some solid jams for comic fans and music fans alike! Their set was amazing and they even had 2 encores! We just couldn't get enough of these guys! Our movie nights keep getting better and better! We showed movies like Goonies, Home Alone and Guardians of the Galaxy! These movie nights are turning into standing room only events so make sure you get here early and don't forget - we NEVER charge admission but do request a food donation of healthy canned food that we bring to Toni's Kitchen food pantry in Montclair! Last but not least - STAR WARS #1 came out! We had a great time watching the excitement on people's faces - from classic Star Wars fans to new one, giving out cool swag like Scottie Young lithographs and Star Wars buttons, watching the original trilogy on the TVs and just talking about the movies with all the fans that came out to show support! Now that we're into 2015, our new year's resolution is to get you more frequent updates on all the cool things East Side Mags is doing so you can get excited and get down here to see what all the buzz is about for yourself! Paul Castiglia and Fernando Ruiz - Riverdale will never be the same! 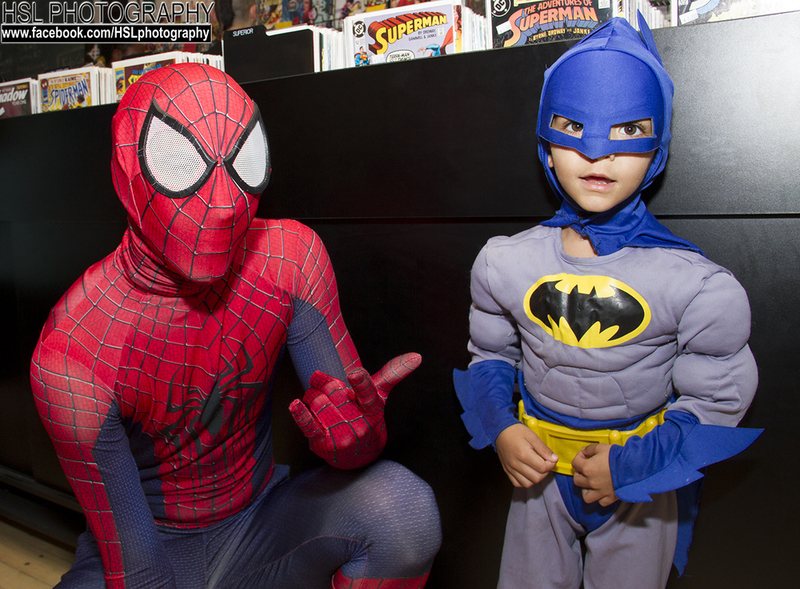 East Side Mags was proud to host Paul Castiglia and Fernando Ruiz today in-store. Writer and artist for Archie Comics, Paul and Fernando were amazing guests. We stocked up on all things Archie, Paul brought some of his own work like Midnight Marquee Actors Studios: Vincent Price (in which he wrote a chapter) among others and Fernando provided free sketches for our customers and signed copies of his work from Life with Archie, Archie's Weird Mysteries (of which he worked with Paul), Death of Archie, Archie's Favorite Christmas Comics and so much more! Two nicer guys - you will NEVER meet. Happy to talk to their fans about Archie or comics in general, they came, they saw, they drew and they laughed! It was a true pleasure to have these guys with us today and extend the Halloween celebration for one more day! Thank you to Paul and Fernando on behalf of Montclair and East Side Mags! We had an amazing time! 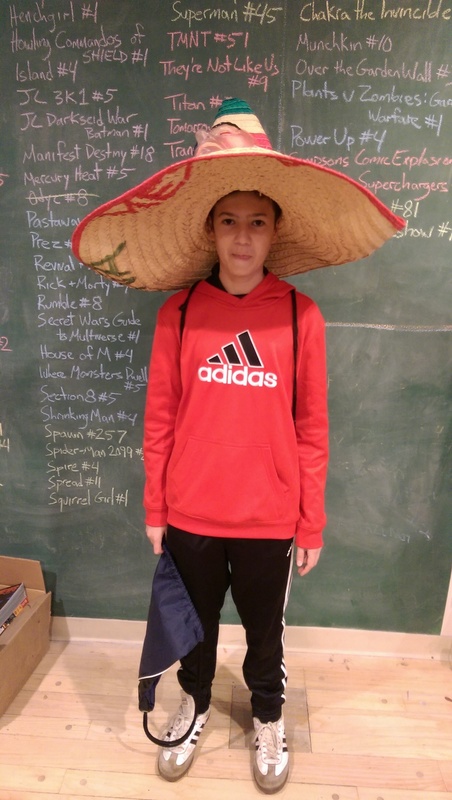 East Side Mags is proud to present our 2nd winner in our Halloween Costume Contest! Here is Isadora as ZOMBIE ANNA from Frozen. 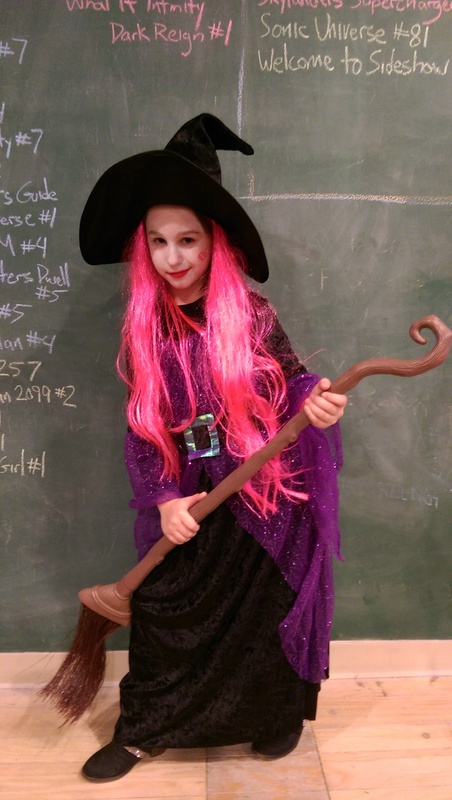 Great costume and she thought of it HERSELF - which is the best part! Zombie Anna will get a free t-shirt and $10 store credit. 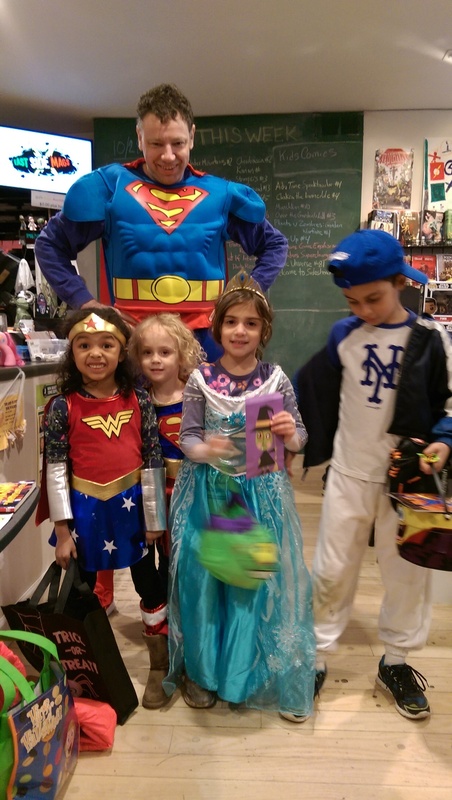 East Side Mags would like to give a BIG thank you to all our trick-or-treaters and Halloween friends for coming out last night, sharing their costumes, partaking in free comic give-a-ways and just having an all-around blast for the festivities! Faye won a free t-shirt and $10 in store credit! Thank you SO much to Brian John Burdzy and Ronnie for having me on the show. I had a blast and I hope to be a part of this again soon! Z is a customer of ours and there was an immediate connection. 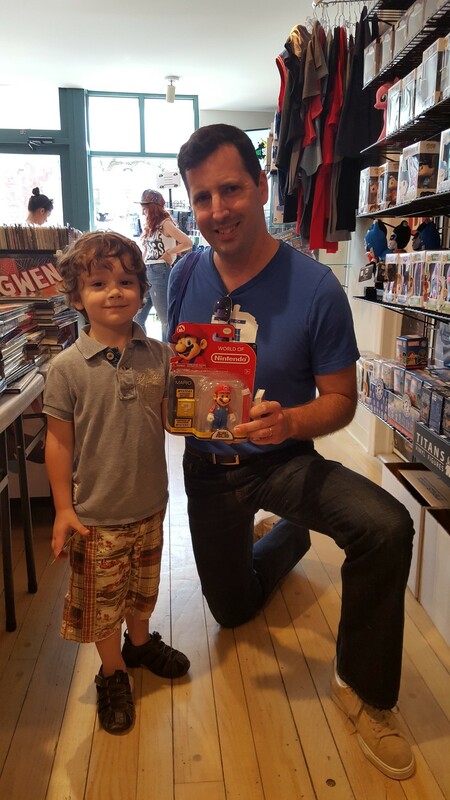 Like most of our customers, Z collects. 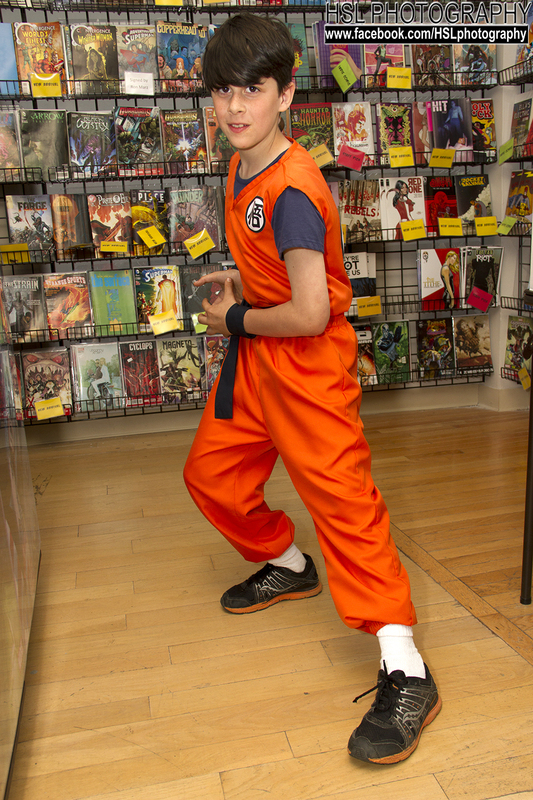 He collects lots of things but not just comics or toys or statues or action figures. 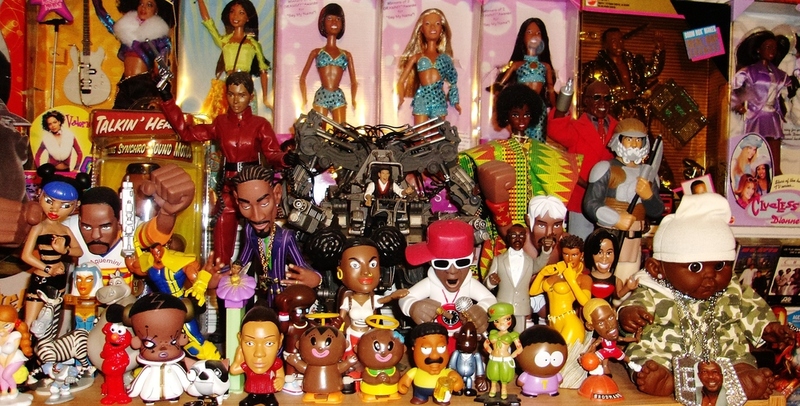 Z collects anything related to Black Pop Culture! His collection is expansive and includes - but is NOT limited to - comics, toys, tapes, vinyl records, CDs, posters, you name it! He even has cassette recordings from throw-back hip hop radio programs from the 1980's!!! His collection is VAST and spans the entire third floor of a house - floor to ceiling! Amazing, right? You can also check out Z's internet contributions below. Collections like his bring it to another level entirely! Last night we hosted a Standard Draft for the new block - Khans of Tarkir. It was a rousing success and TONS of fun! 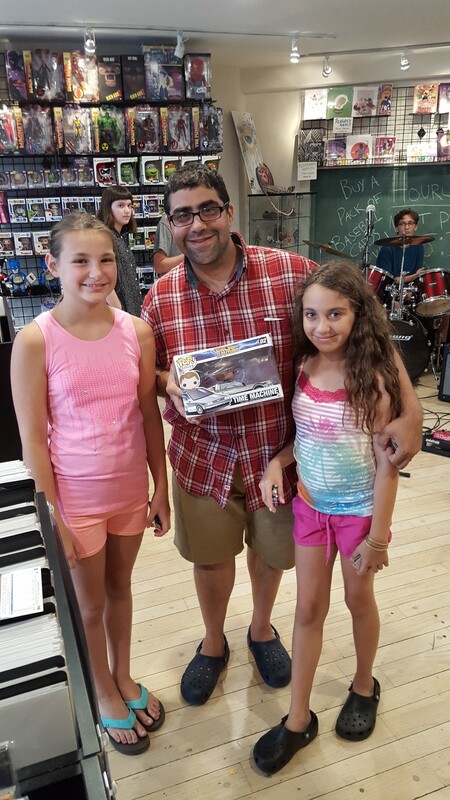 East Side Mags is proud to present our winners of the Magic the Gathering - Khans of Tarkir Standard Draft - Marco and Eshaan! Congrats, guys! Hope to see you both again for our next MTG event!